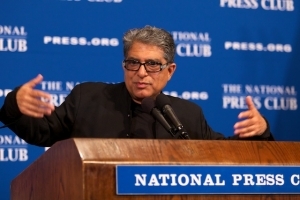 The most fundamental fact of existence is not the universe nor even space, time or gravity, but that we are of aware of the universe, Deepak Chopra, author or co-author of over 60 books on spirituality and mind-body connections, told a National Press Club luncheon audience Wednesday. “When you come into this world, you come with awareness,” Chopra, a physician, said. Expanding that awareness is the theme of Chopra's latest book, Spiritual Solutions. Expansion of awareness is spirituality,  Chopra said. But a baby does not exist by itself, and dialogues – religious, social and historical - constrict the baby’s essential awareness, he said. His book delineates three kinds of awareness: contracted, expanded and pure, the last being the awareness of great spiritual leaders such as Jesus and the Buddha, he said. Personal, global and social problems surface in personal or social contracted awareness, Chopra said. The entire planet is in "contracted awareness," which has been its history and the evolutionary process, but from time to time luminaries, the great religious leaders, have experienced pure awareness, he said. They have been few and far between, but today's technology provides the potential for understanding interdependence and ushering in the next phase of human evolution. Solutions to the problems from contracted awareness appear in the expanded awareness that come with love, joy and compassion, he said. Chopra suggested the best way to get rid of enemies is to improve their capacity for well-being. He cited Gallup studies that found having a happy friend increases your happiness, so that happiness can expand exponentially.